Interactive fiction was the first great computer-game craze. No graphics, no game controllers, no touchscreens — none of that existed yet. You type a command, and the game tells you what happens next. These were the triple-A titles of the early 1980s: sophisticated, complex, involving, literate gameplay. Of course, other genres soon came along... but the text games never went away. An Internet community of IF fans picked up where Infocom and the other old companies left off. I'm one of them; I've been releasing indie IF games since 1995. Now I've started porting my games to the iPhone and iPad. I believe that mobile platforms are the natural home of interactive fiction. Phones and tablets are designed for reading — and IF commands are tweet-sized. Virtual game extras, such as maps or in-game documents, where appropriate. This iOS IF framework is open source. Wanna use it for your own game? Hadean Lands, Shade, and Heliopause all for $4.99 flat. An interactive alchemical interplanetary thriller. Steer a ship to distant stars and see what you find, in this compact science-fictional fairy tale. Winner of the XYZZY Award for Best Writing of 2010. A snack-sized narrative, finishable in one session. Includes a handy status display tab (so you don’t have to type “EXAMINE SHIP” over and over). Bonus ship diagrams and graphics added especially for this iOS release. Shade is a snack-sized experiment in surrealism and psychological fear. It begins as a classic “room escape” scenario; but that’s not how it ends. Play Shade if you’re in the mood for a short trip into an uncertain, shifting environment that might just be a nightmare. Winner of the XYZZY Award for Best Setting of 2000. The Dreamhold is my interactive fiction tutorial game. It’s designed for people who have never played IF before. 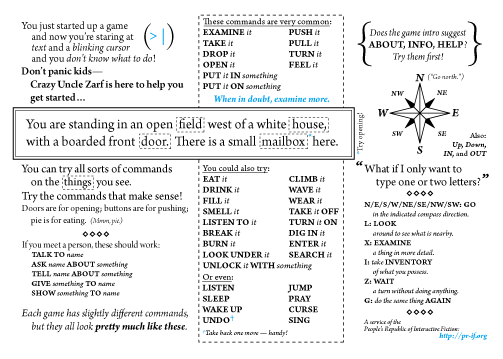 It introduces the common commands and mindset of text adventures, one step at a time. There’s an extensive help system describing standard IF commands, as well as dynamic hints which pop up whenever you seem to be stuck. Of course, you can turn off the hints and the tutorials, and play The Dreamhold as a real game. The puzzles are not extremely difficult, but they should offer some challenge to both experienced players and newcomers. (If the challenge is insufficient, there’s an “expert” mode which makes some of the puzzles harder.) There are also many optional bits to explore beyond the main storyline. I have written many more games than these. I have not uploaded them all as iOS apps, but they are all available as free browser games on the Interactive Fiction page on my personal web site. So Far: A surreal journey of landscape and symbolism. Spider and Web: A story about spies, deception, and the unreliable narrator. A Change in the Weather: My first serious IF game. A short mood piece, with puzzles.